Events where I plan to show art provides motivation to create new pieces. 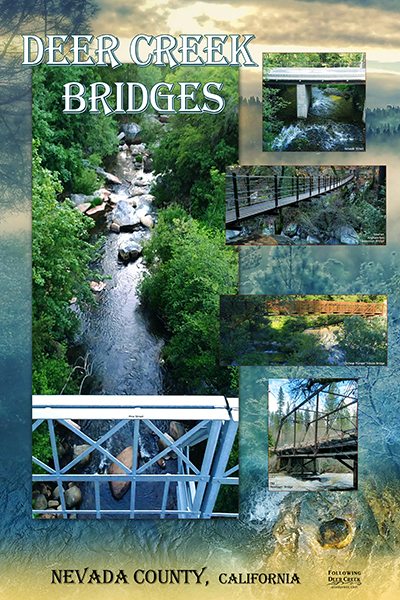 ‘Deer Creek Bridges’ was created for the 2018 Nevada County Fair photography competition. 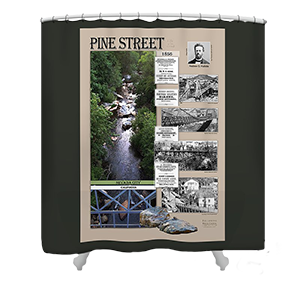 The ‘Pine Street Historic Bridge’ piece was made for display and sale during the 2018 Fall Colors Open Studio Tour. This video was created for the blog post, Native Plants for Healing the Land After Fire. It was produced a few weeks before the Redbud Chapter of the California Native Plant Society conducted their annual Native Plant Sale. It helped tell the story about the importance of native plants in the Deer Creek Watershed and promote the event. Since most of my work is digital, time and hydroelectric generated power (as well as computing hardware) are the main production resources involved in making these creations. As I do background research for posts, I also generate an art piece. At the time of this writing, 62 designs are in the Life on the Creek collection. While I started with graphic designs involving text, Latin names, and waves, several recent posts inspired a new layout direction. 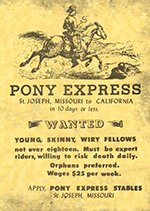 Pony Express help wanted advertisement. ‘Pony Express Riders’ is a blending of a public domain map and a help wanted advertisement. This came about after discovering that Joaquin Miller, Poet of the Sierras (and a mining camp cook who developed scurvy for the post Scurvy in California’s Food Capital) was also a Pony Express rider. 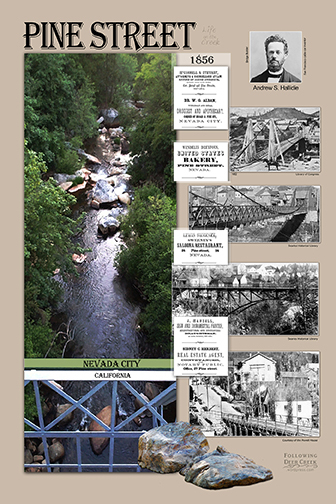 The extinct and disrupted Life on the Creek designs are from the posts Grizzly Entertainment and California Bear Extinction, and Dammed Disrupted Salmon. *In the newer designs, you may notice an absence in the ” wording at the bottom of the Following Deer Creek logo. These pieces were created after I moved the website from a free site to a paid site in an attempt to reduce unwanted advertising clutter. 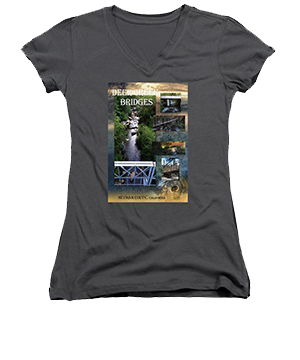 FineArtAmerica.com hosts my artwork online and produces made-to-order prints and household items. At my Open Studios Tour booth (#30) October 13th and 14th, I will have a number of these pieces on display. 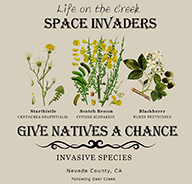 Prominently featured will be Space Invaders – Invasive Species pieces that will be donated to Sierra Streams Institute (SSI). SSI will be using them as incentive gifts for community Scotch Broom pulls that they will be organizing in the fall. Art for a cause…while attempting to lessen resource use…is very satisfying!